Beyond the beauty hall: Boots Protect and Perfect Intense - welcome back, old friend! Boots Protect and Perfect Intense - welcome back, old friend! I'm just back from a lovely brunch in Clapham with my friend Hannah, and on the way home, I decided to pop into Boots to grab some Protect & Perfect Intense serum. I could live in Boots and my advantage card gets considerably more abuse than my credit card does! I've been using the serum since it came out, and for some reason, the last time I ran out, I didn't repurchase. I think the product gets your skin into such great shape that you forget you actually have to work for this smooth and radiant complexion! As soon as I got home, I stripped away my make up and am currently sitting here with a silky soft, post P&P application skin and a nice coating of Rituals conditioner on my hair. *Sigh* I love Sunday's without the boyfriend. 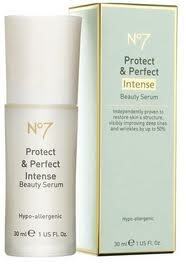 P&P is a great product, suitable for all skin types and is the first clinically proven anti-ageing serum. I used to work for the Professor who developed and trialled the product, and as one of the world's leading dermatologists, I can't stray too far from the great advice he gave me about looking after my skin with anti-ageing products before wrinkles start to appear. Some anti-wrinkle creams are too heavy and rich for young skin, but P&P crosses the boundaries of age and provides results (either reducing existing signs of ageing or for younger skin, keeping them at bay!) Results start to show straight away, but wrinkles are reduced by up to 50% in 4 weeks and after 6 months, your skin actually starts to regenerate: very clever stuff! I've tried the entire P&P range, comprising day, night and eye creams, which I felt had little or no impact. The standout product for me is definitely the serum, which I pair with the Sanctuary's Rich Rejuvenating day cream and Pro Collagen night cream (review to come soon). Boots are currently offering a free gift including sample sizes of P&P when you spend £22 on No.7. A 30ml bottle of P&P Intense retails for £22.50 at Boots stores across the UK, and is now available in the US. So, what are you waiting for? Don't forget to follow The Beauty Hall and tell us your favourite product for a chance to win a great prize! Click here for details.